On-Site Assessment and Training provides the opportunity for experienced workers to gain the qualifications needed to prove they can do the job. It turns existing skills and experience into a nationally recognised qualification such as an NVQ. Having these qualifications also supports the application for a Construction Skills Certification Scheme (CSCS) card. This course is ideal for operatives who are working in the construction industry as a Painter and Decorator, either experienced or just starting out in the industry and would like to earn while they learn. The average timescale for completion is 3-8 months depending on experience and access to assessment opportunities. The aim of this qualification is to recognise the knowledge, skills and competence demonstrated by an individual in the workplace. This Level 2 NVQ Diploma in Decorative Finishing and Industrial Painting Occupations (Construction) Painter provides the opportunity for individuals who specialise in painting and decorating to demonstrate their competence. The course provides a specialist work related programme of training covering key knowledge and practical skills required within the sector. There are 6 units in this qualification suite which are derived from National Occupational Standards. Candidates must undertake a minimum of 6 units to gain the qualification. These are made up of 6 core units (of which all must be taken) to make up the 6 units for the qualification. The units of this qualification can be delivered in any order or combined as necessary to form part of a relevant training programme; allmandatory units must be completed by each candidate. AllLearning Outcomes and Assessment Criteria of the units that candidates are registered to take must be achieved prior to claiming the qualification certificate. Units must be assessed in a work environment, workplace evidence of skills cannot be simulated. A variety of assessment methods are used, such as Observations, Witness Testimonies, Professional discussion, Site evidence, Photographic evidence, Evidence of previous learning and Knowledge Questions. 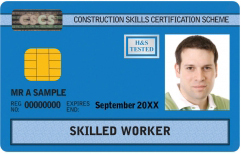 After completing a final assessment successful candidates will receive certification and be eligible to make an application for the CSCS Skilled WorkersBlueCard. There are no formal entry requirements for this qualification. However, individuals must be employed as a Painter and Decorator, and have the potential and opportunity to successfully cover the full range of assessments to gain the qualification. Achievement of this qualification provides opportunities to progress to further qualifications and training such as: Level 3 NVQ Diploma in Decorative Finishing Painting and Decorating Decorative Finishing. As part of lifelong learning Altamira Training encourages candidates to progress and continue with their professional development to enhance their employment opportunities and career progression.